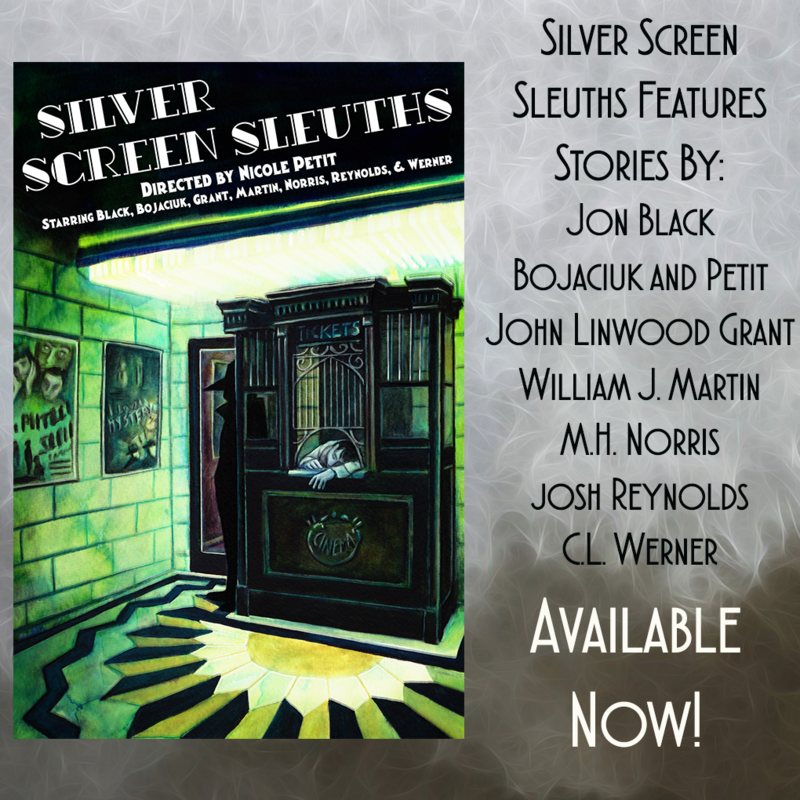 We’re pleased to present our first excerpt from Silver Screen Sleuths, an exclusive look at Nicole Petit & James Bojaciuk’s story. The ideal date: candles, slow music, his arm soft around her back and leading her into the sway. Ginger’s date: elbow deep in caked-on dishwater. She scrubbed rough, sliding the suds away. Ginger pulled a dish out, and she flicked it. Suds landed all over Lucy’s face. Jimmy peeked into the kitchen to find Ginger and Lucy splashing suds at each other. Hank and Jimmy pulled open the Arabian doors (they were neither Turkish nor Ottoman nor Syrian, but had emerged from fairyland unscathed; they were not Arabic, not quite, but refuges from Arabian Nights). The Ambassador passed away into its stodgy halls and the four emerged into a harem. A slim Persian carpet escorted them down rows upon rows of tables; a tent was above them, briefly, and then the fairy-lights of false stars. “The Cocoanut Grove, m’ladies.” Hank smiled like a man duty bound to enjoy his new bankruptcy. A man in a plain-cut Tuxedo glared. The glare descended into a scowl. “We will take it under advisement.” Hank waved the air. Fritz led them on gossamer strings to a far-off, badly cornered table. 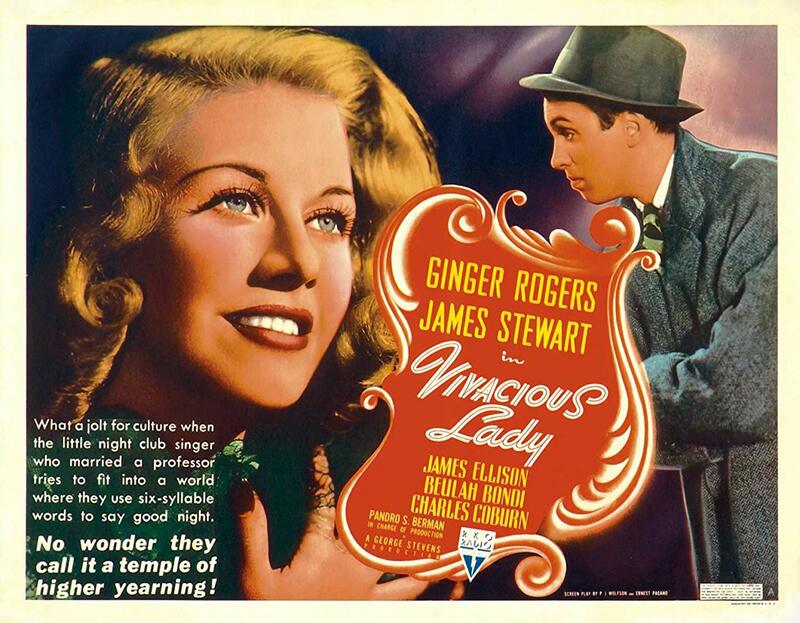 “Your table, sirs, madams.” His grin, Ginger was sure, was also copyright Jack Warner. “Roth, Big Shot Director Roth, Mr. ‘No First Name’ Roth. That’s who.” She gestured to a table meant for patrons who could afford to pay. Down near where the carpet gave way to a glossed-up dancefloor. Ginger gave him a glance. Fat. Middle-aged. Uproariously pink. Fingers curling around his drink in a death grip. Typical Hollywood. “I’ll go and do just that.” She rose, her tone saying I’d stick my tongue out at you, but I’m the picture of refinement and grace. Jimmy grabbed her right arm, Ginger grabbed her left, and both pulled her back down into her seat. Lucy brushed them away, yawned with a pantomime that vaudeville would have found broad, and strode off after Roth. As she went she patted herself down, straightened her dress from “refugee from the costume department” to “second-stringer, background division,” and arranged her hair up and out (but nowhere near up and out enough to invite comparisons to the Bride of Frankenstein). She tap-tap-tapped out across the room, threading the edge of the ballroom without so much as the first syllable of a “How do y’do” to the people she bumped and rocked. With every tap her face grew a little bit sweeter, and her smile a touch more genuine. By the time she was near his table, underneath a metal palm tree, she looked like money. Not a million, not by any means. But decidedly more than a buck-fifty. “No.” He didn’t so much as look her way. “No.” He stirred his drink. She tried to punch him. But between the wind-up and the blow, something snagged. She tried again, then again. “This is the hell I’m good at,” Hank whispered. He gripped her arm tighter and hauled her back, far back, very far back. When she was seated again, storming profanity, Hank held her there by the shoulders. Roth shoved his hand up. The apathy he had shown to Lucy evaporated in favor of exhaustion. The lithe man pulled a book from his breast pocket, turned it to a fresh page, and presented it to Roth. Roth grabbed the book. He rifled through it, then tossed it down. Roth grabbed up a glass of water, waiting on the table for the drunk or the destitute, and poured it out over the booklet. His jowls shook with the wild turns of his head, then he returned to the slow, steady stir of his drink. The lithe man walked away. Lucy grinned, then chortled, then laughed. Now the back-up dancers sashayed out along the stage. Although the visitors to his table didn’t grab Roth’s attention, a little strawberry blonde that took the stage kept him riveted. Peaches Latorre, the talent for the night. Freckles weren’t in vogue, but no man, especially not Roth, seemed to fault her for it. Their gaze was directed elsewhere. Roth missed no move, wide-eyed, tracking the sway of her well-built buttresses. He didn’t even move his eyes when he drank. “Typical. Goes for the dark meat.” Lucy huffed. Drums pat-pat-pattered up into a gale. Horns died down, swings slurred into a whisper; through this, Peaches stepped from the pedestal and slid down the stairs. Dressed in red and sequins shifting over ample curves, she slid across the dance floor with more sways than a cobra. Men sucked in breaths with soft hisses as she passed. They were looking too low to notice the sly smile on her painted lips. If Roth’s eyes were only for her architecture, she only had an eye for business. Peaches stopped by his side and slid her arm around his neck in the way of a lounge singer, with an ease that only comes with practice and an eagerness that only comes with a desire for tips. She slid down into the chair beside him—very near beside him, and leaned across the back of the seat. “Need to hear a secret, sugah?” The Georgia drawl was thick, saccharine. Lucy pantomimed a gag, then gripped Jimmy’s arm, “Time for you to leave.” She walked quickly, now, dragging him toward the back of the club. She propelled him toward the door. And out he went. The alleyway was your typical Los Angeles alleyway, with all the perks you could ever wish: a cat, growling low from behind a garbage can; a stench that refused to be waved away; a broken-brick walk that tripped over itself, falling down cracks. He trailed the walkway, then arrived at the other, smaller backdoor. He rapped on it. It swung open on agonized hinges. A man peeked out. He was a cook, certainly. Jimmy stepped in. The kitchen was a cramped affair: sixteen stations (oven, fryer, stove) shoved into a foot and a half wide work-area. A go-fer held a central position in the room, handing out ingredients as needed. The generous could call it “art deco,” but all that really meant in this case was that if something could be constructed by steel, it was. If it made clean-up easier, the owners could afford to be stylish. “Go on.” The cook shooed him out toward the service hall. The hallway was no less spacious: as he walked, the metal gave way to an unadorned hint of the outer decor. The wallpaper picked up its rich, Arabian hints and, as he neared the end of the hall, the flagstaff floor gave way to lotus carpet. A young brunette with her hair tied back in a ponytail, slumped over on her elbow and bored the way only a young woman could be, stared at him from behind her counter. “Yes, um, yes.” He tumbled his buttons apart, shook his shoulders, and slid the jacket down. He put it on the counter. “Don’t dress up so much. Nobody’s impressed.” She snapped her bubblegum. Picking up his jacket, she took advantage of her rotating chair and kicked herself off into a whirl. In the midst of her spin she picked up a white jacket and swiveled around back facing him. Jimmy supposed she waved him over to the left, but it was hard to tell. It may have been a sneeze. “Do you suppose he got lost?” Ginger sipped her drink. Jimmy found himself fighting for his life. They had given him a tray, very well, he could handle a tray. Then they had placed two glasses of champagne on his tray. Very well, he could handle that, two cups are nicely balanced and don’t fight back. Then they had placed two more, and he shivered. Then they had placed two more, and he shook. Then they had placed two more, and he quaked. Then with a grin even Jack Warner would’ve found too reminiscent of Satan, they give him a final glass. It tottered in his hand like W.C. Fields. As he brought up his other hand to support the tray, he was met with a glare from the service chief. It’s just walking, just one foot in front of the other. So he took a step. And another, and another, and another, and another. The resultant motion was nothing at all that could be likened to just one foot in front of the other, instead it was a wild fairy reel that left the right foot sticking out left, the left foot sticking out right, side steps, panicked balances, all the more panicked counter-balances, and in desperate straits, a spin. Roth was pink. The light didn’t help, certainly, yellow and thick light that hung like candle wisps. But what sealed the deal was Peaches. She said something, while smiling in Jimmy’s general direction, and Roth laughed himself into a breathless squeal that dyed him pork-rind pink. —But his toes got caught on the carpet and he stumbled once, twice, thrice, adrenaline and panic the only things that kept the tray upright, sloshing but never spilling. He stopped still, breath ragged, composing himself. Scattered applause broke out across nearby tables. The applause died down and died out until Peaches was the last person clapping. Slow, deliberate claps, covering her giggles. He smiled, he nodded, then he took a careful step up to their table. “Complimentary, uh, champagne, for sir and madam.” He eyed the nearest glass stem and calculated his grip with the suave grace of an ungreased Ford production line. He settled this one in front of Roth, smiled ever so slightly too wide, and repeated the process for Peaches. She couldn’t stop laughing. Good Lord, this was the best response his acting had ever had. She buried her hands in her face and she shivered with laughter. “I, uh, my friend, see—” Jimmy ventured. Now it happened. He took one step—just one fateful step—and once again his foot caught in the thread of the carpet. He left foot came slamming down, but it was too late. He tumbled, the glasses tumbled, the champagne tumbled all into a sopping wet pile. He rolled off the tray. Well, glory be, nothing was broken (glass or bone). The gentle drum of dancer’s feet approached. “Mr. Roth, I’d really like to discuss what happened between us because you know—” The autograph hound brought such a gale of words that Jimmy tuned them out, simple as switching away from the radio ventriloquist. He hauled himself up to his waist, sitting upright, staring up from below. The tray, though soaked and mildly bent, would still serve. He took it up, settled it comfortably in his lap, and set to scooping up the glasses. When he glanced up again at Roth and Peaches, he found they were still weathering his hot air fairly well. Nothing too unusual, just another touchy fan. The autograph hound seemed ready to remonstrate. He seemed almost ready to slap Roth, the way he moved his arms. Then he turned. The hound threaded between the oncoming storm: Jimmy’s friends. “Did you get us the parts, Jimmy?” Ginger asked, oh so sweet. Hank extended his arm, grasped hands with Jimmy, and pulled him up. Peaches tucked her hand in his and waltzed him out to the dance floor—up the stairs, across the carpet, and into the dance. They slid across the floor and nearly out of sight. “That’s not exactly sporting.” Jimmy leveled his body weight away from Ginger and regained control, leading them backward, past other dancers. Ginger hooked her hand around Jimmy’s waist and yanked him back with her. 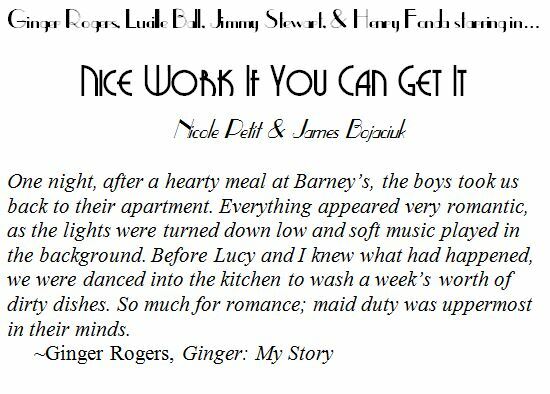 “Just dance with the lounge singer.” Ginger put on the world’s sunniest smile, glared at Jimmy over that sun-dipped goodness, and Lindy Hopped side-by-side with Roth and Peaches. Ginger gripped Peaches’ shoulders and plied her off Roth. She shoved her at Jimmy. Mr. Roth was gasping for breath. “I’m so glad you agree.” Ginger waited. Roth did nothing, still gasping like a fish. His breath smelled like almonds. She tilted her head and swayed back and forth. He followed her waves. Roth’s eyes began to bulge and his skin went from pink to purple-red. Roth slumped over on her. And then he slid down her onto the floor. He convulsed, foaming at the mouth. By the time Ginger had called for help, he had already gone still. Peaches untangled herself from Jimmy, and made her way to Ginger’s side. She looked down at Roth, then patted Ginger on the shoulder.